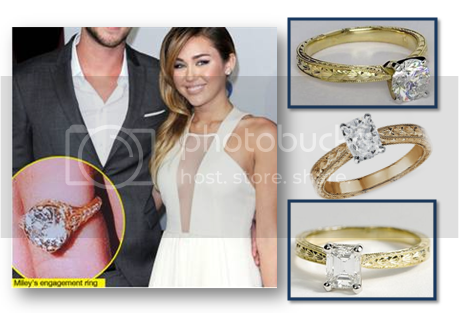 I'm sure you heard the news of Miley Cyrus' engagement to boyfriend Liam Hemsworth and her beautiful vintage inspired Neil Lane ring already setting the trend this wedding season. Blue Nile, who is best known for their engagement and wedding jewelry, has an incredible "Build Your Own Engagement Ring" function, allowing shoppers to recreate a celebrity inspired look for a fraction of the cost. We’ve created a few 'Miley' inspired rings below for under $5,000!